Center on Halsted (COH), the Midwest's largest center devoted specifically to the Lesbian, Gay, Bisexual, Transgender and Queer (LGBTQ) community, partnered with Whole Foods in a single development and has become a model for socially-conscious development in Chicago. The retail portion of the 175,000 square foot center was developed by Bond Companies and honored with a Development of the Year Award given by The Chicago Commercial Real Estate Awards, shortly after the project's completion. Designed by Gensler as a visible symbol of LGBTQ pride, this mixed-use development became one of the first buildings in Chicago to achieve a LEED® Silver certification. 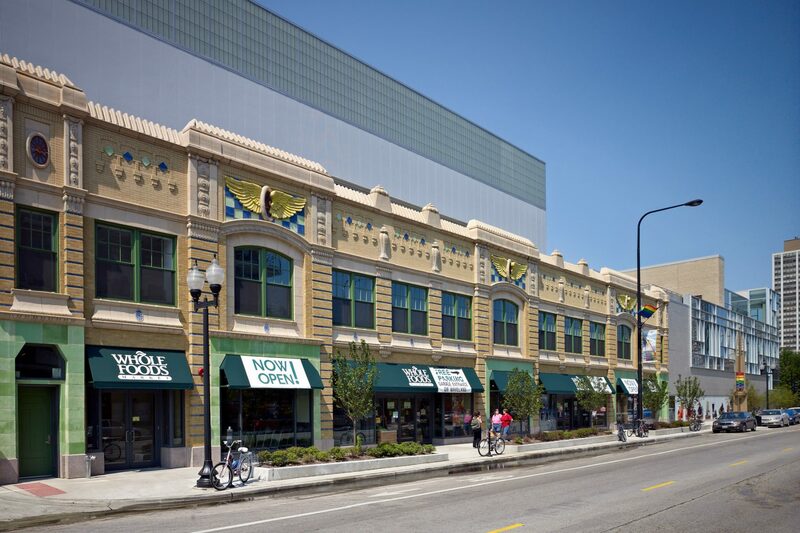 While utilizing the latest environmentally friendly technology, the development of Center on Halsted involved preserving the façade of an obsolete historic building and transforming it into a bustling market and gathering place for the LGBTQ people of Chicagoland. In addition to Whole Foods Market and it's two levels of underground parking, Center on Halsted, located in the heart of Chicago's Lakeview neighborhood, also includes an entertainment venue, a café, office space for resident partners, a technology center, a gymnasium, a theater, a public roof garden, and a number of other unique gathering spaces.